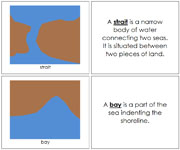 Describes 10 aquatic and land features. 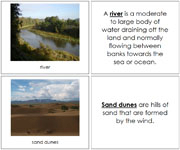 10 aquatic and land features in photographic 3-part cards. 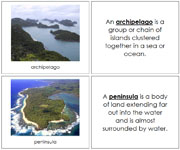 10 aquatic and land features in 3-part cards. 20 Canadian bodies of water. 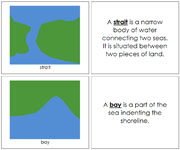 Describes 10 simple land and water forms. 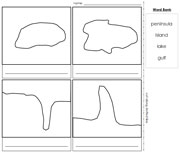 10 Simple land and water forms in 3-part cards. 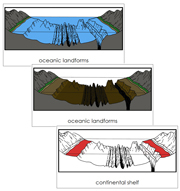 Blackline masters for 10 simple land and water forms. 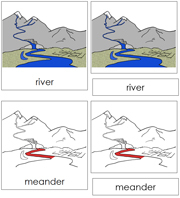 9 Parts of the river in 3-part cards, includes black-line master. 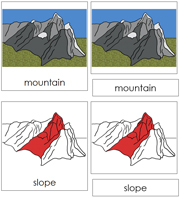 Information and photographic cards for 5 types of mountains. 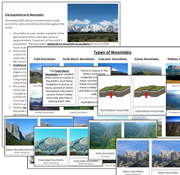 Fact cards and picture cards of volcanoes.